LibreOffice galore! Last week saw the announcement of the latest in the 4.x series, and I decided to build LibreOffice 4.4.4 packages. This time however, they are created for Slackware 14.1. The stable release of Slackware deserves the latest stable office suite to keep you guys productive. I do not leave users of Slackware-current out in the cold. Those who are running slackware-current are willing to experiment, not afraid that something may break and will rely on their skills to fix what gets broken along the road. So I decided to upgrade the LibreOffice 4.4.3 packages for Slackware-current that I had in my repository, not to 4.4.4 but in a big jump, all the way to 5.0.0.rc2. LibreOffice 5 is waiting for us behind the gates and it is promising to make an impact. The source code for the second Release Candidate for LibreOffice 5.0.0 was made available a few days ago as well, and I have not heard anything negative about my earlier packages for the first Release Candidate. So there you have it! 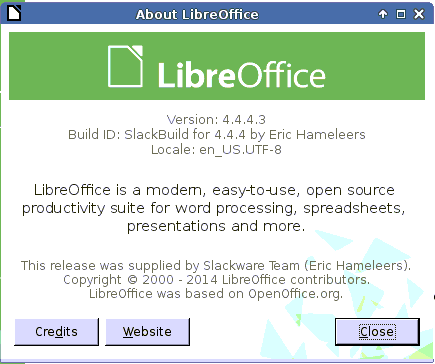 LibreOffice 4.4.4 for Slackware 14.1 and 5.5.0.rc2 for -current. Perhaps a good time to remind you that you can use slackpkg+ to manage your 3rd party packages if those are maintained in Slackware-compatible repositories (like mine). The “slackpkgplus.conf” configuration file for slackpkg+ already has example entries for my repositories – it will be a matter of “slackpkg update && slackpkg upgrade libreoffice” to upgrade to my latest versions. Posted: 6 July, 2015 in Slackware, Software. Thank you, Eric. Libreoffice 4.4.4 is running smoothly here under Slack 64 14.1. Eric, again many thanks for keeping us slackers happy. Running -current and so far 5.0.0.2 is performing admirably. But unfortunately, I have (rc2) invisible labels on focused buttons and comboboxes, just like others reported for rc1. It seems to be connected with oxygen-gtk theme, but I’m unable to change it for libreoffice, so I cannot confirm that. Thanks Eric, keep up the great work. 5.0.0.rc2 working great on -current/MATE. Indeed am getting the blanked buttons still. The toolbars don’t seem to stay put. Particularly the text formatting toolbar keeps disappearing. Hi Eric! The upgrade to rc2 went smooth. The blank focused buttons still persist however. how could you show all buttons in your screenshot?? Thanks! At least then all your buttons will be visible. Looks ugly though. Thanks again eric for the latest libreoffice. your work on these extras is always appreciated. It looks like Writer does not retain the Printer Settings > Properties > Device > Paper size setting. I set it to “A4”, but upon the next Writer invocation it is back to “Letter”. ERROR: ERROR: Missing files at /tmp/build/tmp-libreoffice/libreoffice-4.4.4.3/solenv/bin/modules/installer/scriptitems.pm line 1199. 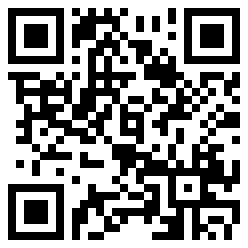 Can’t find in slackware or libreoffice site??? John, that is not the actual error. Something else will have gone wrong much earlier in the process. Please use something like pastebin if you intend to post huge amounts of compiler output. I will have to give it another try. John, you could just install my package… there is no real need to compile it yourself unless you are doing this for the learning experience. I successfully used your slackbuilds for several generations of libreoffice (and others), with a few problems I learned from. A new much larger virtual machine and Bobs my uncle. Everything builds fine business. Thanks for all your work. In order to compile LibreOffice, I give my VM 2GB of RAM, 16 GB of swap and additionally the compilation needs in excess of 40 GB free disk space. Do you plan to build the recently released 5.0.0rc3? 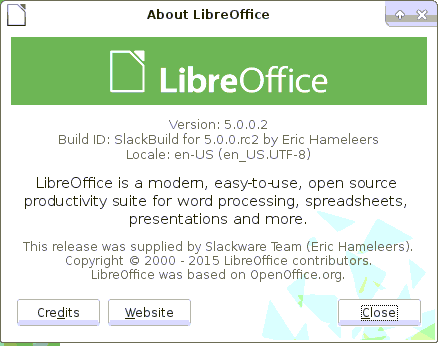 I uploaded 64bit packages for LibreOffice 5.0.0.rc3 yesterday (slackware64-current). It will take a while to get the 32bit packages compiled as well. Yes, I’m running 64-bit and there is a new splash screen. I haven’t tested thoroughly yet. But so far so good. Adding a softlink to png 16 does not solve the issue as the version label ( PNG14_0 ) is looked at.